As Christians we suffer many persecutions and tribulations, but it is the righteous judgment of God by the trials we endure which makes us worthy of the kingdom of God. (2 Thessalonians 1:4-10). So that we ourselves glory in you in the churches of God for your patience and faith in all your persecutions and tribulations that ye endure: Which is a manifest token of the righteous judgment of God, that ye may be counted worthy of the kingdom of God, for which ye also suffer: Seeing it is a righteous thing with God to recompense tribulation to them that trouble you; And to you who are troubled rest with us, when the Lord Jesus shall be revealed from heaven with his mighty angels, In flaming fire taking vengeance on them that know not God, and that obey not the gospel of our Lord Jesus Christ: Who shall be punished with everlasting destruction from the presence of the Lord, and from the glory of his power; When he shall come to be glorified in his saints, and to be admired in all them that believe (because our testimony among you was believed) in that day. We can take great comfort in knowing Jesus has told us that in the world we will have tribulations, but He has overcome the world and we can find peace in Him! His message to all was that He was sent by His Father for the salvation of man, then would leave and return to the Father and what we ask in His name would be asked to the Father. (John 16:27-33). By the comfort we receive from God through hard times in our life it allows us to be able to comfort others who are hurting and suffering. (2 Corinthians 1:3-7). 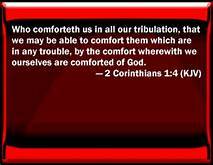 Blessed be God, even the Father of our Lord Jesus Christ, the Father of mercies, and the God of all comfort; Who comforteth us in all our tribulation, that we may be able to comfort them which are in any trouble, by the comfort wherewith we ourselves are comforted of God. For as the sufferings of Christ abound in us, so our consolation also aboundeth by Christ. And whether we be afflicted, it is for your consolation and salvation, which is effectual in the enduring of the same sufferings which we also suffer: or whether we be comforted, it is for your consolation and salvation. And our hope of you is stedfast, knowing, that as ye are partakers of the sufferings, so shall ye be also of the consolation. There is nothing whatsoever that can separate us from the love of Christ including tribulations. (Romans 8:35-39). ← Where Did Naaman’s LEPROSY Go ?